Singles Knockout winner - Les Spedding. Singles Knockout runner up - Andy Marr. Heaviest Fish out of competition - Dave Lyth - 10 lb 13½ oz. Christmas match winner - Unknown - lb oz. Heaviest Bag of Fish - Ian Russell - 20 lb 09 oz - 19th December 1982 - there was no trophy for this until the 1983/84 Season by George Cockerill. 1st - - lb oz. 2nd - - lb oz. Total weight for the season - 1,373 lb 11 oz. 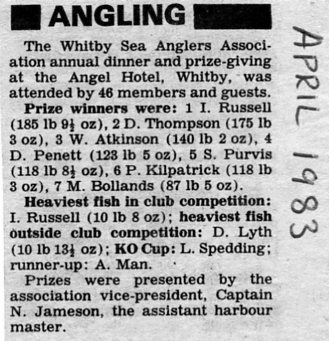 Total Number of fish - Whitby Sea Anglers Assoc. did not start recording fish numbers until 'The Peter Sutton Memorial Cup' for the Greatest Number of Fish was presented by Mr Alec Bain in 1985/86 Season. Notes:- PDH 14/12/2012 from ledger. 21st November 1982 - Dave Lythe 1 fish of 9 lb 07 oz. 19th December 1982 - Ian Russell 1 fish of 10 lb 08 oz. 1 fish 5 lb 10 oz. Leader board at end of October - after 8 matches. Leader board at end of November - after 15 matches. Last Sunday of December. Was this the Christmas match as D Johnson fished and all 28 members fished? Leader board at end of December - after 22 matches. Members results, from ledger - 11 members fished. Leader board at the end of January - after 29 matches. Leader board at the end of February - after 36 matches. 5th S R Purvis, 6th Paul Kilpatrick, 7th M Bollands. Below are the figures re-calculated in an Excel spreadsheet - to nearest ½ oz. Below are the top 7 - as reported back in 1983. It is possible the names on the ledgers index are incorrect. The Whitby Sea Anglers Association annual dinner and prize-giving at the Angel Hotel, Whitby, was attended by 46 members and guests. 7 - M Bollands - 87 lb 05 oz. D Lyth - 10 lb 13½ oz. KO Cup - L Spedding, runner-up A Marr. Prizes were presented by the association vice-president, Captain N Jameson, the assistant harbour master. Last edit Thursday 13th February 2014 - PDH.